The amount of involvement and application/transfer of my own understanding and knowledge of PYP framework and philosophy is deepened with each workshop I prepare for and deliver. 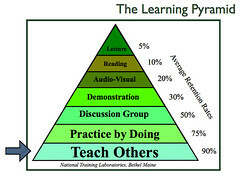 That pyramid image with the base showing that we retain 90% of what we teach is 100% true! Collaborating with another colleague whom I only share a common understanding of the PYP with is such a testament to the power of the IB. We communicate prior to the workshop without having met before (in most cases) and share our experiences and stories as we construct shared meaning through the workshop framework. We plan on the fly once we meet in person and together we adapt and adjust once we get to know the participants in our workshop. We learn from each other and take away new strategies and ideas. While there are common IB objectives, each workshop experience is unique. Each room is different – sometimes there is a considerable range in participants; while other times participants are more homogenous. This can also depend on the level of a workshop. In a level 1 regional workshop the diversity of the group can be huge; while in a level 2 or 3 workshop there is a more shared understanding of the PYP and everyone in the room is there to go deeper to enhance teaching and learning even further. Being a part of a person’s or school’s “PYP Journey” while not knowing what the end looks like for them is highly motivating for me. I love bumping into people who attended a workshop I led or co-led at a future workshop who share their success stories of how much they’ve grown and changed. I love the ambiguity of “loving them and then setting them free”. The 2.5 day workshop experience is INTENSE! You enter a room as a stranger and you leave with a new network of PYP friends. 6. An IB Workshop is the action cycle in motion. Reflection! As a WSL every moment is one hinged on reflection – Is this what the group needs most right now? How do I know? How will I change course to ensure that questions and points of tension and moments of wonder are built into the framework of the workshop? Truly differentiation at its best. Challenge – every participant group poses diverse problems and brings forward new challenges. Exploring solutions and what “that might look like” stretches me and causes me to dig deep in my PYP well to support them. Seeing shift happen right before your eyes. Change is directly measurable in a workshop – you can literally see it happening right before your eyes. I recently conducted an on-site workshop and witnessed the faculty of a school collectively come to the realization that in order for their school to succeed in their PYP journey that collaboration was going to be essential. The time they spent collaborating in the workshop opened their minds to the impact that the PYP can have not only in the classroom, but on their faculty too. Every time I return back to my school after giving a workshop I am better for it. Giving workshops changes my practice. I learn IN experience with the participants as we share in experiences to construct meaning. My own perspective shifts and I bring new insights and experiences to my role as a coordinator as I support my own colleagues in their PYP journey.